In my previous article, we discussed about web api self hosting using console application. 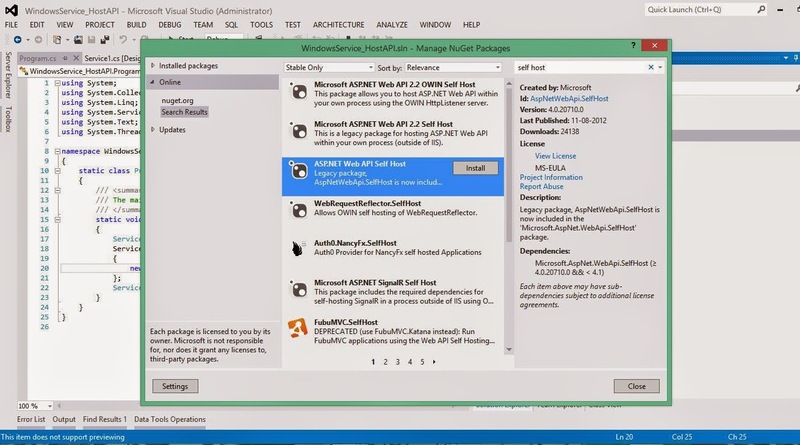 This time, we will use the windows service to perform the self hosting of the web api. 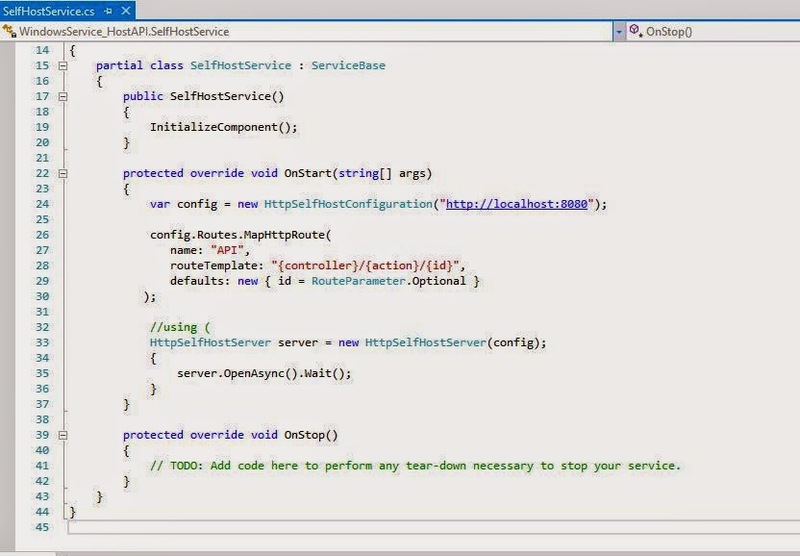 So let's start by creating a new windows service project type. We call it as WindowsService_HostAPI. In order to perform the self hosting of web api, we need to add references to the self hosting libraries. 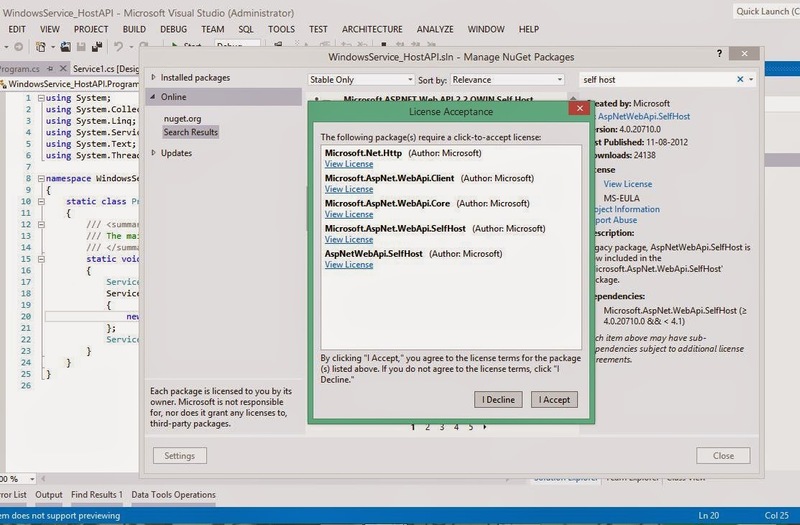 For this, we use the nuget package manager and install the references. Next, we select the project in which we need to add the references and the following libraries get added to the project. Next, we add a new item of the type web api controller class and name it as ValuesController, which inherits from ApiController. Make sure that the suffix of the class is 'Controller'. This is required for the routing process to handle the incoming request. We remove all the default methods and add a simple method named GetString which returns a string value. Build the solution. Now the api is ready to be hosted and for this, we only need to install the service and than start it by navigating to the list of installed services. To host this windows service, go to the service design view, right click and select Add Installer. 1. Go to the properties of serviceInstaller1 and change the ServiceName property to WebAPISelfHosting. This will be name with which the service will get installed. 2. Go to the properties of serviceProcessInstaller1 and change Account property to LocalSystem. or you can start the visual studio command prompt (as an administrator) and use the following command to refer to the above location of installutil.exe. Execute the following command in the command prompt to install the service. I have used only relative path here for the example. Make sure that you use the complete path, from the root. This will install the service on the system. Go to the list of installed windows services, select the service named WebAPISelfHosting, right click and start the service. 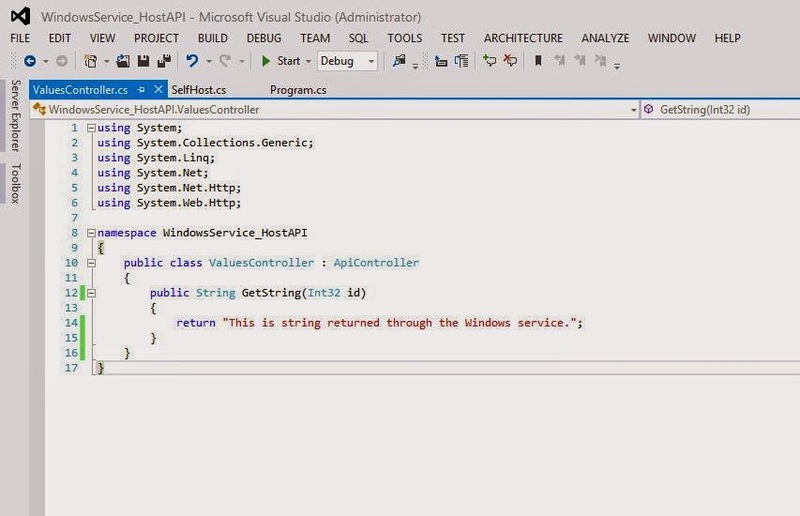 Web api is now hosted and we can create a client to generate request to the api. 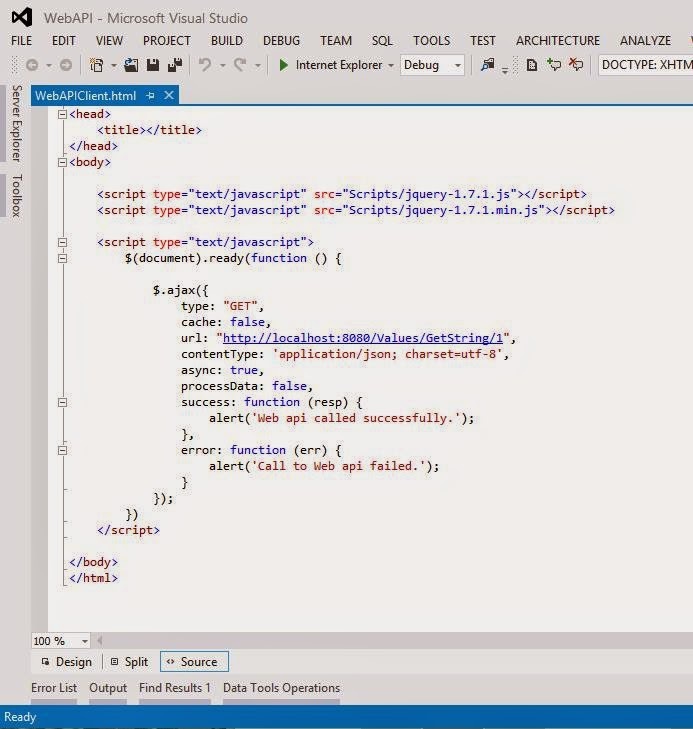 For this we create an html page which will make an ajax call to the api. 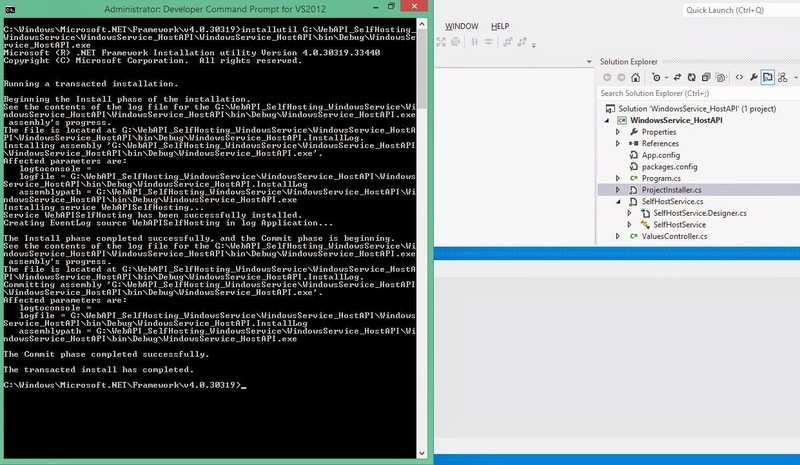 Run the client page and also start the network capture using F12. 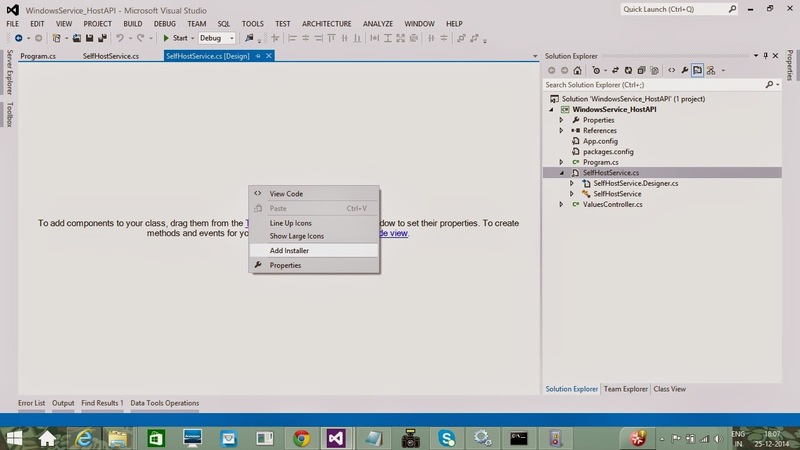 See the results, web api returns the results. 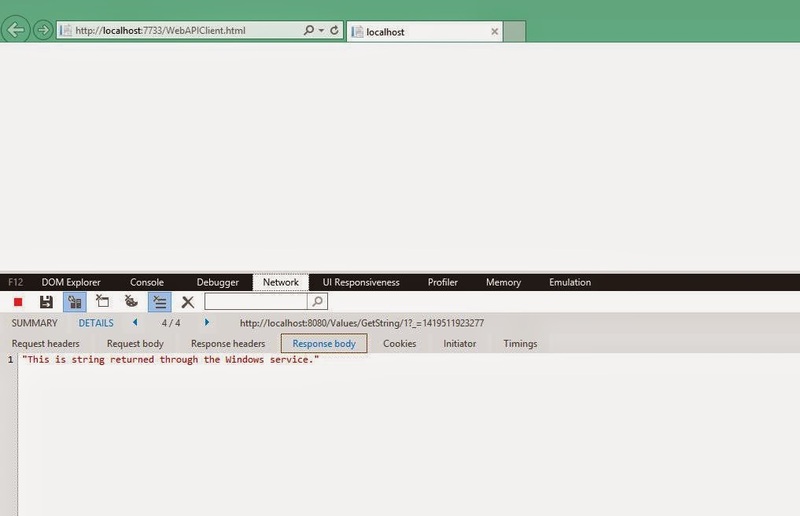 So this is how we can host the web api using a windows service. Hope you enjoyed reading it. Happy coding...!! !